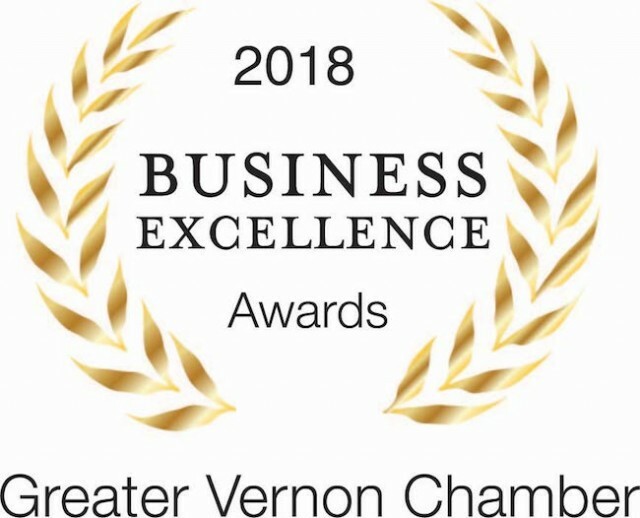 The finalists for the 2018 Business Excellence Awards in Vernon have officially been decided. The winners in each category along with the Business of the Year and People’s Choice will be announced at the Business Excellence Awards Gala March, 9 at the Vernon Lodge and Conference Centre. One Step Foot Care, The Beauty Bar, Roost Solar, and Spruce Salon lead the way as all four were named finalists in two different categories. There were more than 300 nominations, with more than 90 individual qualifying nominees for award categories ranging from Non-Profit Excellence Award to the Manufacturer of the Year. People’s Choice award is open online at the Vernon Chamber website, where the public can vote for their favourite nominee until Feb. 23. The Gala is the North Okanagan’s largest business event of the year. This year’s theme is “Join us in the Winner’s Circle” where the winners will be announced. The event will feature door prizes, including a package from Predator Ridge valued at over $1,000 and a West Jet Voucher for a flight anywhere West Jet flies and prizes for the best Kentucky Derby attire. Tickets for the Gala are on sale now through the Chamber.